I’m dedicating this post to my friend Marcelo. Marcelo and I became friends when I lived in Manta, Ecuador in 2003. Originally from Manta (a seaside town in Ecuador), Marcelo is a wonderful guy with a winning smile and a mischievous personality. During the year that I lived in Ecuador, Marcelo and I shared many adventures together. One of my favorite memories of Marcelo was when he took a group of us spear-fishing. I never got in the water, but Marcelo bravely jumped in and actually landed us lunch. I’ll never forget him cutting up the fish, squeezing lime over the pieces, and preparing a simple ceviche, right there on the boat. Ceviche (also spelled seviche and cebiche) is a popular dish in Latin America made by marinating fish or shellfish in citrus juice (or another acidic liquid). The acid in the citrus literally cooks the fish and the result is a flavorful and refreshing dish. Ceviches were my favorite food to eat in Ecuador. My favorite restaurant during the year I lived there was on a popular boardwalk overlooking the Pacific Ocean. You could get an ice-cold beer, a basket of chifles (fried plantain chips), and a delicious ceviche for just a couple of dollars. As you watched the people walk by and the waves come in, it was easy to contemplate the idea of never leaving. But back to Marcelo; because he is the reason for this post. Marcelo now lives in Belgium and I’m guessing that he misses ceviche as much as I do. At least he misses it enough to send me a message via Facebook that I should really feature ceviche on my blog. In his message to me, Marcelo listed all the possible ceviche ingredients as well as different marinade options (such as beer, coca-cola, and lemon or orange juice). While he gave me plenty of ideas, I noticed that he did not offer up his recipe for ceviche even though he boasted in his email that his new Belgian friends loved it. 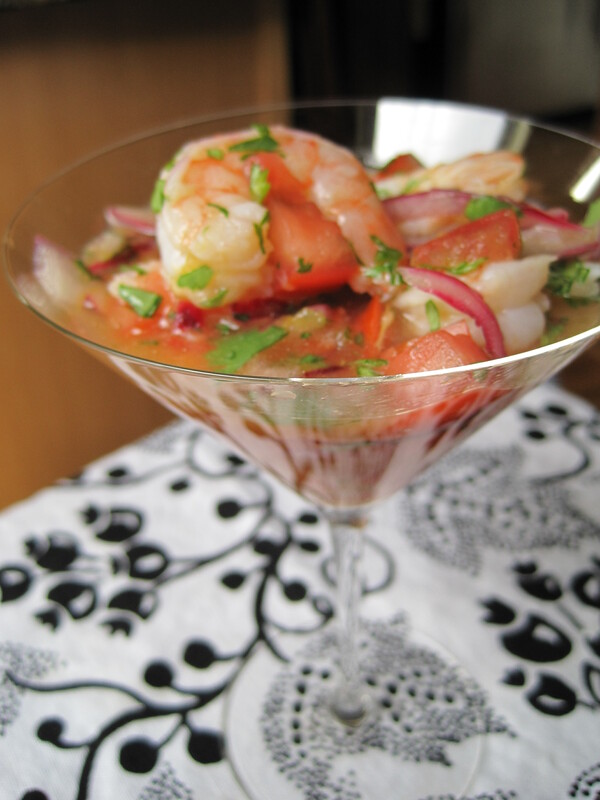 Fortunately, along the way I found a recipe for ceviche (cravings are a powerful force) that is worthy enough to share. And while I think you will be quite happy with my version, I am hoping that Marcelo will see my “gringa” recipe and will feel compelled to share his own, more authentic version! While we wait for Marcelo to send us his recipe (don’t hold out, Marcelo! ), I hope you enjoy this recipe. Serve it alone for a light dinner or place it in martini glass for a classy appetizer. Ceviche is perfect for entertaining because it is served cold and benefits from a long marinating time making it easy to prepare ahead of time. When making the recipe, you’ll notice that I boil the shrimp before I marinate them. While the lime juice will cook the shrimp, boiling the shrimp reduces the risk of possible contamination and results in a quicker preparation time. Buen provecho! Fill a medium saucepan with water and bring it to a boil. Add the shrimp and cook briefly for about 3 minutes. 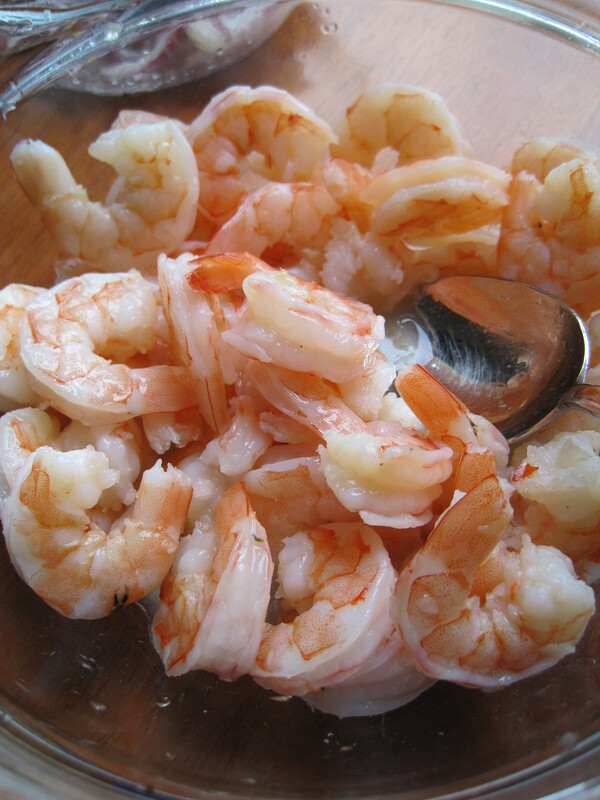 Remove the shrimp using a slotted spoon and place in a medium bowl. Reserve 1 cup of the cooking liquid and discard the rest. 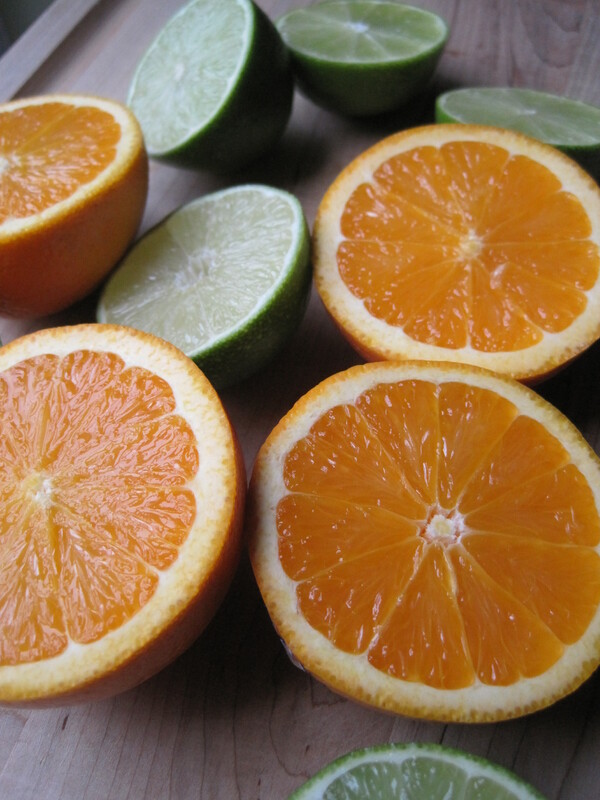 Whisk together the 1 teaspoon of salt and about 1/4 cup lime juice in a small bowl. Pour the salt and lime mixture over the shrimp and toss to combine. Cover the shrimp with plastic wrap and allow the shrimp to marinate in the refrigerator for at least thirty minutes. Once the shrimp has finished marinating, add the onion and chopped tomato to the shrimp mixture. Whisk together the reserved cooking liquid, the orange juice, ketchup, olive oil, and minced cilantro in a small bowl then pour over the shrimp. 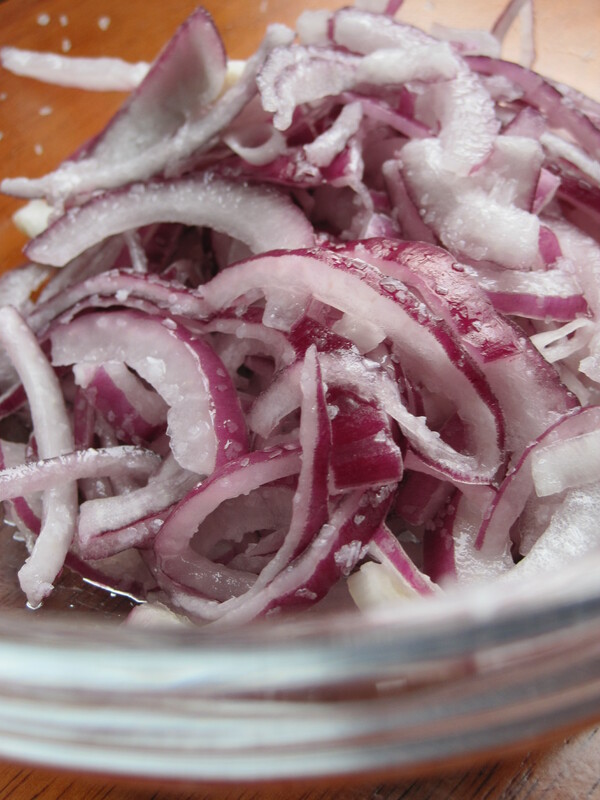 Allow the mixture to marinate for at least 30 minutes in the refrigerator before serving. Serve with fried plantain chips or popcorn. It is nice to see that you found the way :), I am not going to hold the recipe… I did not write it in the begining because a lot of “cousine words” are new for me :), I mean I am not familiar with them. As I mentioned you there are subtle variations in the style how people depending on the city or the beach prepare Ceviche. So lets do it my friend. I’m glad you enjoyed the recipe and thanks for inspiring it! I’ll certainly think of you when I’m eating my ceviche!